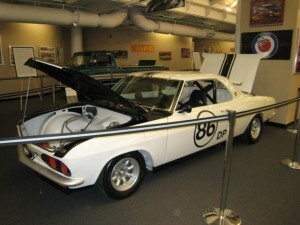 This page is still under construction but will eventually feature specialty Corvairs such as the Yenko Stinger, V-8 Corvairs, prototypes, race cars and custom mods. Please check back later. At the CORSA convention in Detroit, 2007, we were treated to a tour of the GM Heritage Museum. The museum houses a collection of unique and special cars from all of GM’s marquis. For our visit, GM pulled out all or most of its Corvair specialties. The visit to the Heritage Museum was truly an experience of a lifetime for any auto enthusiast. The following Youtube video taken by Scott Szalkowski reveals several special Corvairs including the Monza GT and Astro 1 concept cars, as well as the Electro-Vair and a few other gems from the past. Thanks Scott for the fine video. Hope you enjoy this.